Under the Obama administration, the federal government appeared to ease up on prosecutions of American Islamist charities linked to terror. This was a marked change from the years after 9/11, when scores of charities were shut down after prosecutors found financial and logistical links to terrorist groups across the globe. This effort culminated in 2008, when the Holy Land Foundation was tried in court on charges of financing terrorism. Federal prosecutors listed a considerable number of prominent American Muslim organizations as "unindicted co-conspirators." The Trump administration should clamp down on domestic Islamist terror financing. Eight years of a more permissive attitude has afforded Islamist groups the chance for a resurgence. Islamist charities do not just provide a means to move money; they also offer legitimacy to American Islamist organizations struggling to free themselves from decades of allegations of extremism. Islamist charitable endeavors abroad serve to sanitize the Islamist agenda at home. The most common terrorism link for American Islamist charities involves, unsurprisingly, the Palestinian territories. Where do charitable donations for the Palestinian territories end up? In the Gaza Strip, Hamas, which is designated a foreign terrorist organization, oversees every facet of society, especially the social services in which Western charities work. From the distribution of medicine to the running of schools, orphanages, and kids' summer camps, Hamas rules the roost. 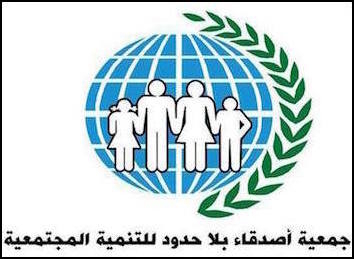 The Gaza-based Unlimited Friends Association for Social Development (UFA) is close to the Palestinian Hamas movement. UFA claims to "provide relief, emergency and developmental services to marginalized areas and people in need." And it probably does. Its social-media pages show happy children playing in the sun, buildings constructed, and food packs distributed. But UFA operates with the political support of senior Hamas figures. And the support of Hamas means the support of a genocidal terror group that has pledged to eradicate Jews across the globe, that throws its political opponents off rooftops, oppresses women and homosexuals, fires rockets at Israeli schools and homes, and uses Palestinian children as human shields to advance its murderous cause. UFA regularly collaborates with Hamas officials. In 2014, envisioning the "right of return" for Palestinians, it organized a ceremony at which the guest of honor was Mustafa Sawwaf, a prominent Hamas minister. Sawwaf had argued in the Hamas newspaper Al-Risala that "Israel's disappearance is a necessity [according to] the Koran — that is a truth that we have learned and that we have been teaching since the first intifada, which was the Palestinian people's first step toward ending the usurpation of Palestine by the Jewish gangs." In 2015, UFA hosted a public meeting with Mohamed Abu-Shkian, a senior Hamas official and the mayor of Nuseirat. They discussed "joint cooperation to implement projects that serve the various categories of the Palestinian community." 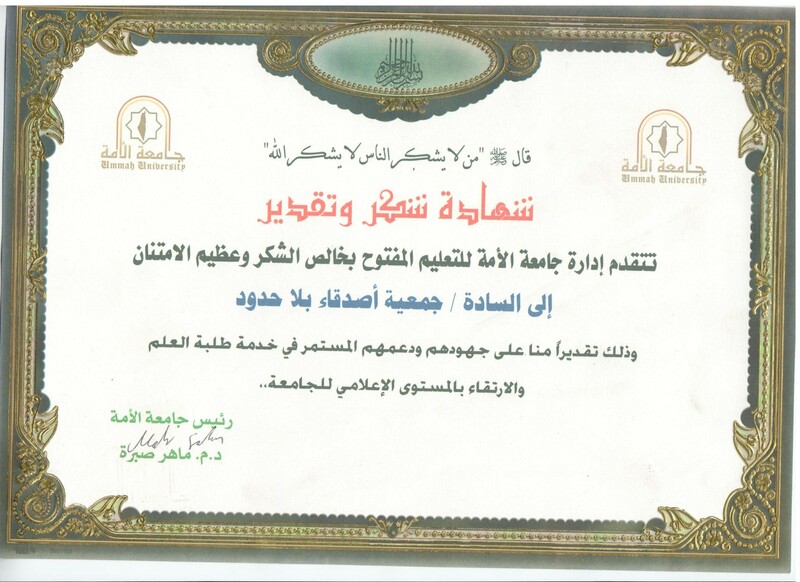 Abu-Shkian, whom Hamas media has nicknamed "Mohammed the Conqueror," is a vocal supporter of the "mujahedeen" against Israel, has spoken at the graduation ceremony of a Hamas terror-training program, and has addressed crowds at a ceremony commemorating Hamas terrorists. Not especially shy about its Hamas connections, UFA openly advertises projects funded by U.S. charities in prominent Hamas literature. And on its website, UFA boasts a certificate of support from Ummah University, an institution in Gaza directly controlled by Hamas's interior ministry. 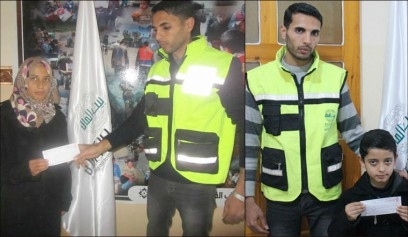 UFA appears to be a cog in the Hamas martyrdom machine — the charity regularly hosts events financially benefiting "the families of martyrs and prisoners." Like Hamas, UFA is not shy about its hatred of Jews either. In a post published on one of the charity's social-media pages, UFA officials wrote: "We ask God to drive away the anguish of the heroic prisoners in the Nazi Zionist jails and to free Al-Aqsa Al-Sharif [the Noble Al-Aqsa] from the filth of the most dirty Jews." UFA published these photos showing an official of U.S. charity Baitulmaal handing out checks, at UFA's offices, to "the families of martyrs of the Palestinian people." UFA's most important U.S. supporter is Baitulmaal, another charity. Saying they help Baitulmaal distribute cash to the "families of martyrs of the Palestinian people," UFA officials have published photos to corroborate the claim. These cash handouts are part of an "Orphan Sponsorship Program." In videos published by the UFA, it defines orphans as those who have lost their fathers (not their mother), some of whom, it claims, were killed resisting "the ongoing slaughter against the Palestinian people." 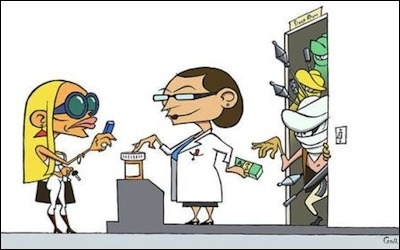 UFA and the U.S. charity Baitulmaal have such a close relationship that they even share the same staff. UFA officials Jomaa Khadoura and Amgad Mansor identify themselves as Baitulmaal employees. Mansor has promoted the views of Nabil Awadi, an Islamic cleric whom the Daily Mail has described as the "key financier" of the Islamic State. The Trump administration should take a close look at these and other charities. 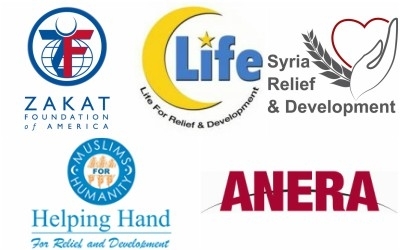 UFA boasts of financial and logistical support from another six U.S. charities: Helping Hand for Relief and Development, Life for Relief and Development, the Zakat Foundation of America, Syria Relief & Development, United Muslims Relief, and American Near East Refugee Aid (ANERA). These are just a few American charities at which a Trump administration should take a closer look. On social media, UFA refers to American taxpayer funding. In 2013, it announced a project funded by the USAID and implemented by the U.S. charity Mercy Corps. Are taxpayer dollars funding a Gazan charity that works with Hamas, funds the families of "martyrs and prisoners," and incites hatred against Jews? UFA, as with many Western-funded Palestinian groups, gets away with much of this perhaps because of the appearance of its work. UFA appears to function as a "da'wah" group that inherently benefits Hamas. Da'wah is a form of social outreach generally employed by terrorist organizations to reinforce their rule. By providing social services, Islamist terror groups gain political and moral legitimacy among the people under their control as well as among their supporters abroad. But da'wah is also "crucial to terrorist activity," counterterrorism expert Matthew Levitt writes. "They provide cover for raising, laundering, and transferring funds, facilitate the group's propaganda and recruitment efforts, provide employment to its operatives, and serve as a logistical support network for its terrorist operations." American taxpayer funding of UFA is not the first instance of its funding of the Hamas da'wah system. In 2007, ANERA (with which UFA jointly organizes projects) provided the Islamic University of Gaza with $140,000 of USAID money. The university was founded by the "spiritual leader" of Hamas, Sheikh Ahmed Yassin. In 2007, according to Palestinian media, 16 of the university's lecturers and teachers were elected Hamas members of the Palestinian legislature. And in 2008, rockets and explosives fired by Hamas at Israeli civilians were reportedly produced at the university. But da'wah efforts can be more basic. In areas targeted or controlled by terrorists, groups such as Hamas coordinate with charities to provide social services and welfare. Some counter-terrorism experts believe that this facilitates an influx of unchecked foreign funds, frees up money for violent operations, and whitewashes the work of terrorist organizations. Aid money is fungible, as is already recognized under official understanding of material support for terrorism. In 2010, the solicitor general, Elena Kagan, now on the Supreme Court, explained that "Hezbollah builds bombs. Hezbollah also builds homes. . . . When you help Hezbollah build homes, you are also helping Hezbollah build bombs." Da'wah is not confined to the Palestinian territories; it also threatens American lives. Other terror groups have learned from the Hamas and Hezbollah. In 2012, the Times of London reported that al-Qaeda terrorists in Mali "have subsidized state utilities, capped food prices and made welfare payments to the needy." And in 2014, I discovered that British "charity workers" were building schools in Syria that bore the Islamic State flag, all paid for through fundraising efforts in Britain. Islamist charities linked to terrorism do provide charitable services, including welfare, children's summer camps, and educational programs. This allows them to acquire Western funding without raising too much suspicion. But the da'wah system ensures that such charitable services serve to prop up Hamas's grip over the Gaza strip. The da'wah problem is not new, but it demands the attention of the new administration. Hundreds of charities operate in the Palestinian territories. Certainly some Palestinian charities do not host high-profile visits with senior Hamas leaders, financially reward the families of "martyrs and prisoners," and incite hatred against Jews. The U.S. taxpayer and American charities should not be funding one that does.